This article describes a detailed method for estimating productivity losses retrospectively, i.e., after the hours have been incurred. The proposed method uses the productivity losses from an MCAA Bulletin published in 2011, in which the MCAA averaged the results from four well-known overtime studies. Using this method, one applies the MCAA's productivity factors to the actual hours on a week-by-week, worker-by-worker basis to estimate inefficient hours. Among its several advantages, the method a relatively time and cost-effective way of providing detailed results, as it can be used to show the inefficient hours for a given worker or crew, or the inefficient hours in a given week or timeframe. The Sections below include a brief introduction to the MCAA Bulletin, a description of the proposed method including the steps involved with setting up the Excel model, and the advantages and potential disadvantages of employing this method. "Modification Impact Analysis Guide," Publication No. EP 4150-1-3, published in 1979 by the U.S. Army Corps of Engineers (COE). The MCAA then provided a series of charts for each relevant workweek (50 hours per week, approximately 55 hours per week, 60 hours per week, etc.). Each chart shows the results of the applicable studies in terms of the Productivity Index as a function of the duration of scheduled overtime. Between one and four studies were charted, depending upon the workweek. 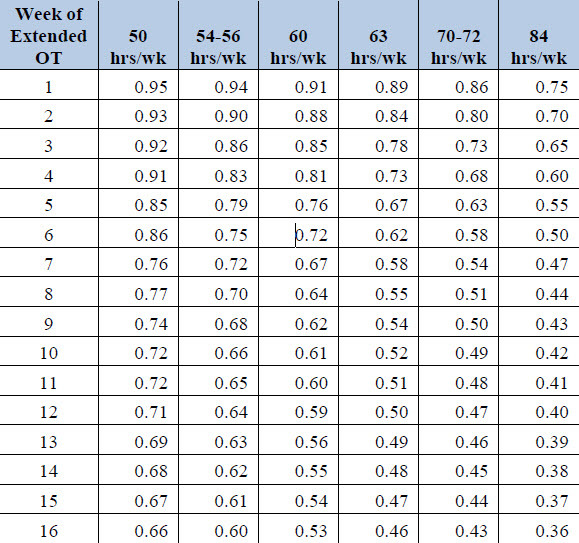 For example, the chart for the 50-hour workweek includes data from all four studies (BRT, NECA, Thomas, and COE),4 while the chart for the 84-hour workweek includes data from NECA's study alone,5 as the other studies did not evaluate the impacts of an 84-hour workweek. In the balance of its Bulletin, the MCAA provided a table summarizing its results (discussed below), and explained and gave examples of the prospective application and the retrospective application of its PIs to estimate productivity loss. While the method proposed in this article is generally consistent with the simple example of the retrospective application provided in the Bulletin, it is a far more detailed approach. Table 1 below is a recreated version of the MCAA's results table.6 The results indicate that the Productivity Index (PI),7 and therefore actual worker productivity, decreases both as the weekly hours increase and as the duration of overtime work is extended. For example, given a 50-hour workweek, the table indicates that the first week of overtime results in a PI of 0.95, or a 5% loss of productivity, while the tenth consecutive week of overtime results in a PI of 0.72, or a 28% loss of productivity. For a 60-hour workweek, the PIs are 0.91 (9% loss) in first week and 0.61 (39% loss) in the tenth week, or more extensive losses than the comparable 50-hour workweeks. The method described in this Section applies the PIs (and resulting productivity losses) from the MCAA's table, Table 1 above, to the actual hours expended by each worker in each week of a project. Thus, it is a retrospective analysis in which one can quantify not only the total loss of productive time, but also the lost hours for a given person, in a specific week, or over a given timeframe. As a preliminary matter, this author has not, in prior analyses, interpolated between the data points provided by the MCAA. One might reasonably argue that in the second consecutive week of overtime, if a worker expended 67 hours, his or her PI may fall between the PI value for the 63-hour workweek (0.84) and the PI value for the 70 to 72-hour workweek (0.80). However, given that (i) the MCAA does not address such interpolation, and (ii) the studies upon which the MCAA's values are based do not provide data for say a 67-hour workweek, an analysis that includes interpolation between data points may (rightly) come under significant criticism. Therefore, the analysis described below uses ranges that are consistent with the data provided by the MCAA, e.g. : workweeks between 0 and 49.9 hours are assigned a PI of 1.0 (no productivity loss); workweeks between 50.0 hours and 53.9 hours use the PIs from the "50 hrs/wk" column; workweeks between 54.0 hours and 59.9 hours use the PIs from the "54-56 hrs/wk" column; etc. Table 2 below is excerpted from a larger table in which productivity losses were calculated for all workers over the entire duration of a project. It shows only John Smith's time over a six-week period, from the week ending 21 September 2014 (Week 62 of the project) through the week ending 26 October 2014 (Week 67 of the project).